PCIT is a behavioral intervention for children ages 2-7 years old and their parents or caregivers, and is used to increase a child’s social skills and cooperation, improve the parent-child relationship, increase confidence in parents, as well as decrease child behavior problems such as defiance and aggression. With more than 150 efficacy studies, PCIT training has been shown to positively affect the behavior of children with issues including insecure attachment, aggression, disruptive behaviors, temper, and non-compliance. 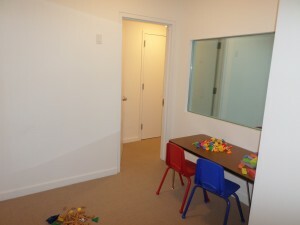 Parents are taught in a playroom while being coached by a therapist behind a one-way mirror through an earpiece so parents get immediate feedback on their use of learned parenting skills. This helps parents to learn rapidly the correct use of skills, and keeps children unaware of the therapist overlooking the play session. What do parents and children learn in PCIT therapy? PCIT teaches play therapy skills to reinforce positive child behavior, and behavior management skills to decrease negative child behavior. Treatment has two phases: child-directed interaction (CDI) and parent-directed interaction (PDI). During the CDI, parents learn play skills similar to those used in play therapy to engage their child in a play situation with the goal of strengthening the parent-child relationship. During PDI, parents learn to direct their child’s behavior with clear, age-appropriate instructions and consistent consequences with the goal of increasing compliance from their child. How long does PCIT therapy last? The length of PCIT treatment varies, but families remain in treatment until parents have demonstrated mastery of the treatment skills and rate their child’s behavior as normal. The average length of treatment is 16 weeks with weekly 1 hour sessions. We are one of only a few official PCIT centers in Manhattan. We have 7 trained PCIT clinicians, 3 of whom are Level 1 PCIT Trainers. When thinking about Parent-Child Interaction Therapy (PCIT) many often focus on its effectiveness with disruptive children. What is sometimes overlooked though is how effective it is in mending a parent-child attachment that may have been disrupted due to a variety reasons (e.g., divorce, long work hours, parental mental illness). Such was the case in the following example, which highlights the positive results of this highly researched treatment method. During playtime, mother would sit next to Johnny without engaging with him and when she did, it lacked enthusiasm. Mother learned specific play skills that resulted in their play-time being full of warmth, love, positive energy, positive attention and enthusiasm. Mother often presented as depressed and lacked energy. Mother presented as happier with more energy. Mother lacked confidence in interacting with Johnny and handling his misbehavior. Mother exhibited confidence in using the play and parenting skills that she had learned. Johnny exhibited oppositional behavior and aggression at home. Oppositional behavior and aggression at home significantly decreased and when Johnny did exhibit these behaviors, mother was confident in handling them. Mother felt overwhelmed and anxious when having to deal with Johnny and his brother in public places. Mother felt confident in telling Johnny and his brother her expectations of them while out in public and in implementing consequences if they did not follow her directions. Overall, the above case example highlights the positive outcomes of PCIT not only in decreasing a child’s disruptive behaviors, but also in creating a warm, positive relationship between parent and child that is full of fun, enthusiasm, security and confidence.